They are calling it the search for the last kakapo, according to Fairfax newspapers. A Conservation Department (DOC) team flew to Fiordland - the endangered birds' last mainland stronghold - in the hope of finding evidence of their existence in historic breeding areas. The trip was sparked by a credible-sounding report from trampers that the ground-dwelling parrot's distinctive "booming", or mating call, was heard in the remote Transit Valley, near Milford Sound, on New Year's Day. If audio recorders left on the valley's rugged ridgelines pick up further booming, it will be the first confirmed sign of kakapo on mainland New Zealand for decades. Kakapo Recovery Programme manager Deidre Vercoe Scott said the mission was a long shot, but the discovery of new birds would be significant for the population's recovery. 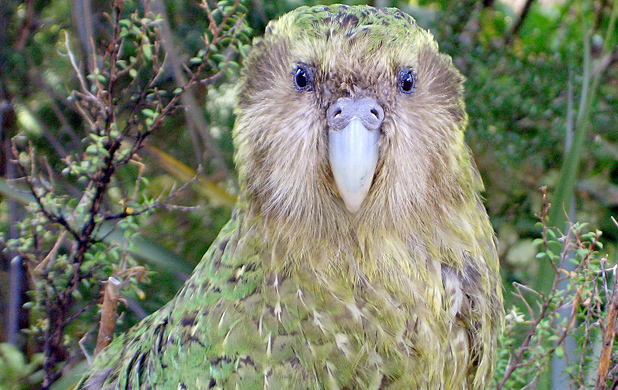 Once threatened with extinction by stoats, ferrets, weasels and cats, the kakapo is now threatened by poor genetics. All but three of the remaining 126 birds, living on two predator-free islands, originate solely from Stewart Island stock. Scientists believe that genetic bottleneck has led to complications with the breeding programme, including high levels of infertility and embryo death. Concerns about poor genetics has prompted DOC to consider removing one bird, Basil, from the breeding programme after the death of four of his young progeny since 2004, including one young male that died last week. Southland-based DOC technical support manager Andy Cox, whose first kakapo-related trip to the Transit Valley was in 1976, said finding birds with Fiordland DNA was potentially valuable. "This report sounds particularly hopeful and we've just got to keep our fingers crossed," he said. Kakapo can live for 90 years, and some Fiordland kakapo fitted with radio transmitters in the 1980s have never been found. A DOC-led search in Fiordland in 2006 proved fruitless. Last week, Vercoe Scott's team spent four nights camped on the eastern side of Transit Valley in an area known as "kakapo castle". The trip was funded by the Christchurch-based Mohua Charitable Trust. 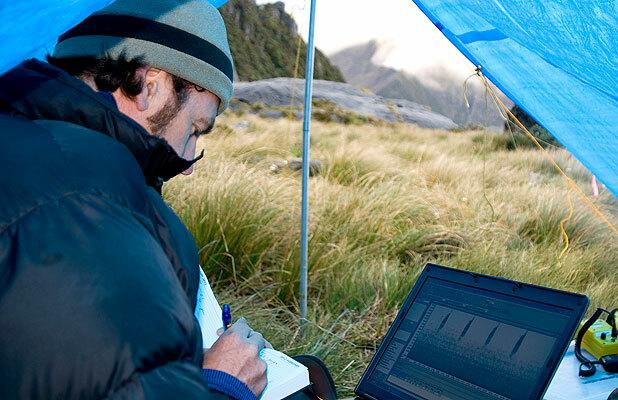 The team set up audio recorders and checked known breeding sites. Vercoe Scott said there were no fresh signs of kakapo. "I think it's quite unlikely that we'll discover anything this year, but we'll earmark that area for the next breeding season and return those recorders just to make sure," she said. DOC intends to retrieve the recorders within two weeks. The species seemed doomed until the discovery of about 200 kakapo on Stewart Island in 1977. However, numbers continued to drop, hitting a low of 51 in 1995.